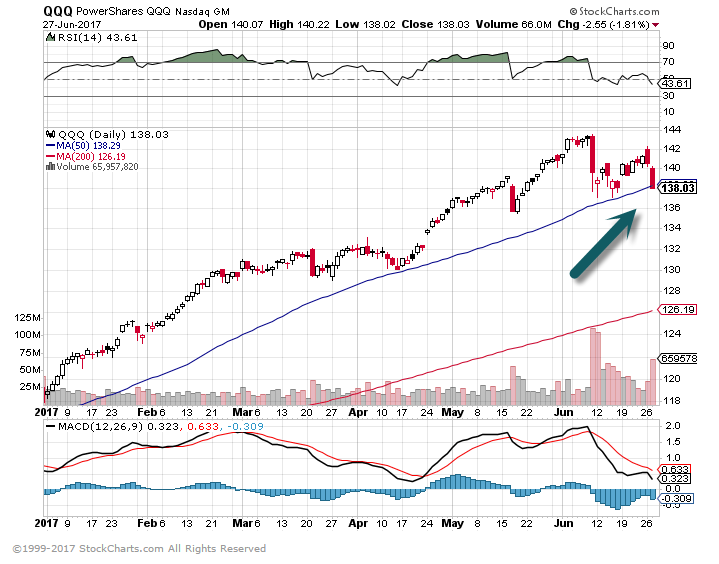 2.As I Stated Multiple Times…Don’t Wait for “tech bubble” to Pop. Expensive Yes but Bubble Another Story. 2017 vs 2000: Are Equities Really In A Bubble? During investment bubbles, the gains over the years reach near-silly levels. 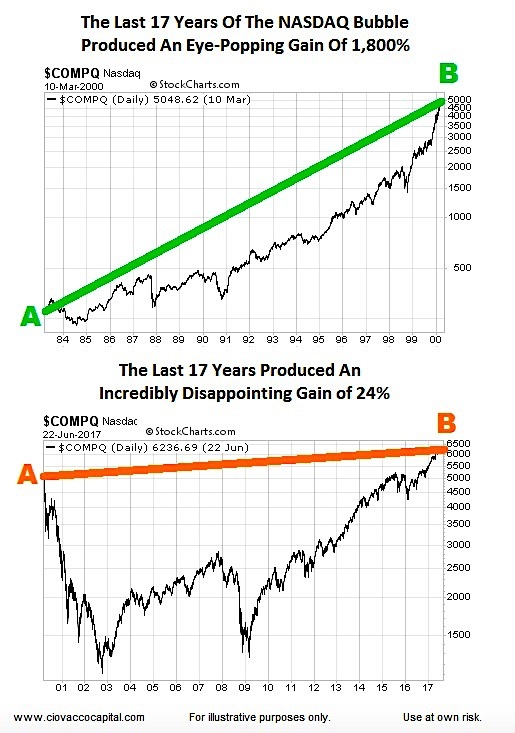 For example, the last 17 years of the dot-com bubble featured an 1,800% rise in the NASDAQ Composite (INDEXNASDAQ:.IXIC) – see the first chart below. 4.On Top of Low Stock Market Volatility…U.S. and Global GDP Lowest Volatility in History. 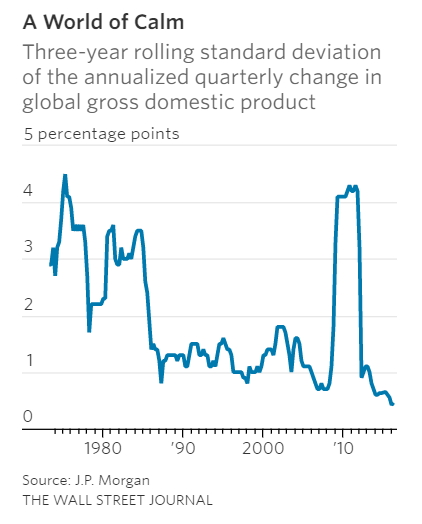 Over the past three years, the standard deviation of the annualized change in U.S. gross domestic product—how far it has tended to swing each quarter from its underlying trend—is just 1.5 percentage points, or about as low as it has ever been. It is a trend that is being matched elsewhere, with global GDP exhibiting the lowest volatility in history. 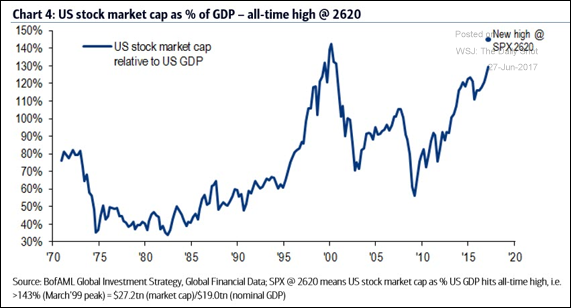 Equity Markets: The US stock market capitalization as a percentage of the GDP hits a record high. The stock market capitalization to GDP ratio is a ratio used to determine whether an overall market is undervalued or overvalued. The ratio can be used to focus on specific markets, such as the U.S. market, or it can be applied to the world market depending on what values are used in the calculation. 6.While Everyone Worries About Politics, Earnings are Killing it. U.S. Earnings up 14% Y over Y..Europe Best Earnings in 7 Years. Fears of a eurozone breakup. Concerns over unrest in the Middle East. And an increasingly angry middle class frustrated by the sluggish pace of economic growth. For years the financial markets have been swayed by such geopolitical threats — and the response of central banks to them — but that dance is over now, according to high-profile fund managers. While political risks such as the U.K.’s Brexit and the Trump presidency featured highly in discussions at FundForum last week, many at the Berlin conference noted the market is now largely ignoring such political upsets. Instead, the focus is on the positive tone of updates coming from the corporate world. “It’s bubbling on a micro level. It’s extremely exciting,” said Allan Polack, chief executive at PFA, Denmark’s largest commercial pension fund with over $75 billion in assets under management. That optimism about corporate health is supported by a surprisingly strong first-quarter earnings season in both the U.S. and Europe. About 65% of the companies on the S&P 500 index SPX, -0.81% beat revenue expectations, while 75% topped forecasts for earnings per share. Earnings overall rose 14%, the highest growth rate since the third quarter of 2011, according to FactSet data. What’s more, full-year earnings guidances were generally better than anticipated, fueling hopes that corporate performance can drive U.S. stock markets to fresh records in coming quarters. Europe also surprised to the upside, scoring its best earnings season in seven years. 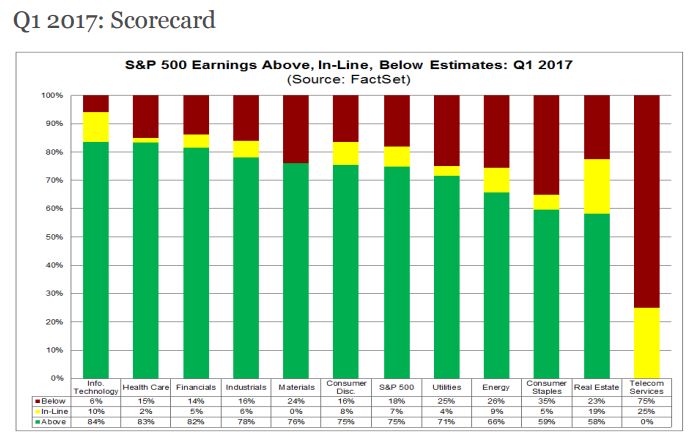 For the second-quarter earnings season, which is kicking off next month, earnings growth for the S&P is expected about to be 6.5%, the FactSet data show. The American consumer still drives the global economy, but that baton will likely be passed to China’s middle class sometime this century. According to McKinsey, just 4% of China’s urban population was considered middle class in 2000. By 2020, 76% will be—a 19-fold increase. And with more spending power comes greater consumption. 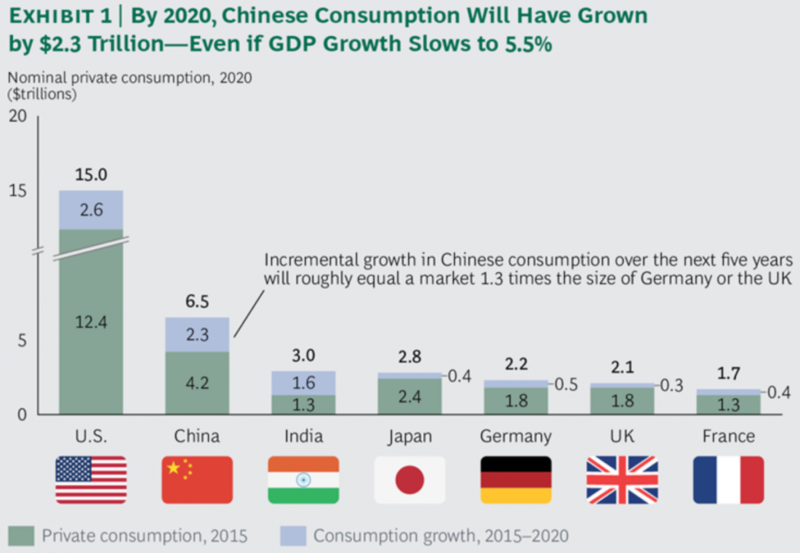 Boston Consulting Group projects China’s total consumption will increase by 55% to $6.5 trillion by 2020. That’s more than the UK, Germany, and France combined. 8.10% of U.S. Families Own 75% of Wealth. Last week when I sent around the chart with the US income distribution I got a lot of client questions about the US wealth distribution. 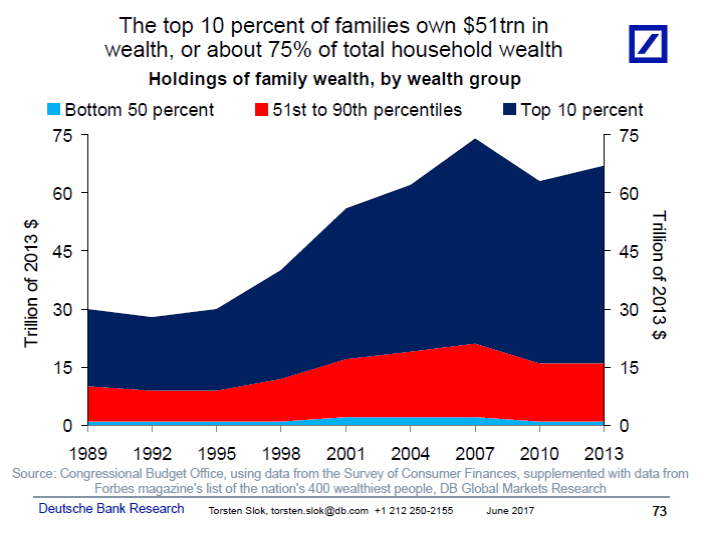 The chart below shows that the top 10% of families in the US own about 75% of total household wealth. 9.Read of the Day…Scott Minerd at Guggenheim has been right on interest rates…. Yield Curve Behavior Explained Why are long-term yields falling when the Federal Reserve is raising rates? The Yield Curve Will Invert, But at What Level? Rather than being accommodative, the Fed may actually become more restrictive than it expects. The Fed is projecting longer-run inflation at 2 percent, but if the market perceives that inflation is going to stay around 1.5 percent or lower, then the Fed could actually be ahead of the curve on inflation, and a lot closer to the end of tightening. The growing list of categories experiencing downward price pressure, including commodities, energy, apparel, retailing, owner-occupied rent, etc., makes price acceleration to the Fed’s 2 percent target unlikely anytime soon. 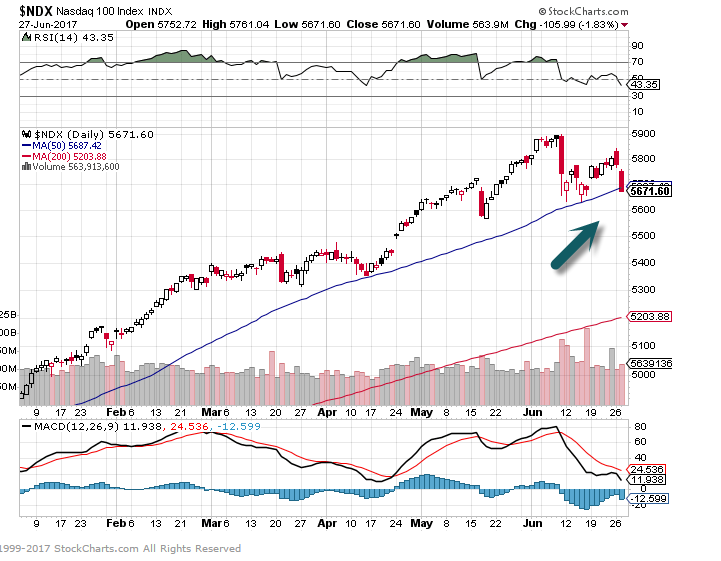 If this is the case, the market is discounting the fact that the Fed will have to stop the hiking cycle sooner in order to avoid further downward price pressure. The fed funds rate may already be nearing the neutral rate. The neutral (or natural) rate—the estimated real short-term rate that is in place when the economy is operating at full potential and with stable inflation—has been declining for the past decade in the United States and now is estimated to be essentially zero in real terms. The decline in the neutral rate results from the declining potential for U.S. growth resulting partly from reduced productivity and declining population growth. With core inflation currently running at approximately 1.5 percent, the Fed is less than two hikes away from the neutral rate in nominal terms. Moving the fed funds rate above the neutral rate, could be excessively restrictive. The market is pricing the probability of the Fed getting close to the neutral rate sooner than expected. Foreign central banks are distorting the term structure of interest rates. As the Bank of Japan, the European Central Bank, and the Bank of England press on with their quantitative easing (QE) programs, the shortage of high-quality assets could be suppressing all yields, including those on risk assets. Moreover, the Fed has already estimated that the large-scale asset purchases and maturity extension program of QE may have reduced the 10-year Treasury term premium by 80–100 basis points. Only when QE has been reversed will long-term rates have the opportunity to rise. Whatever the source, until the structural issues around growth and inflation are addressed, the markets are likely to be stuck in a low-rate environment perhaps longer than anticipated. This prolonged period of low rates is leading to distortions in asset prices, which will become more pronounced in time and inevitably lead to destabilizing bubbles that will threaten the economic expansion, ultimately bringing down prices on all risk assets. 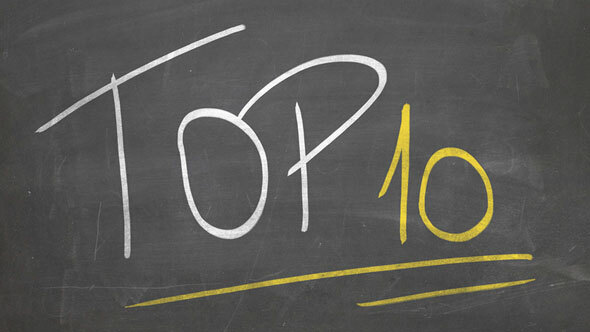 10.Do You Want to Raise Successful Kids? Many parents assume that it’s good to praise children’s abilities because it boosts their confidence and self-esteem, which in turn paves the way to success. However, a growing body of research suggests that praising children for their ability destroys their love of learning, their ability to persist in the face of failure, and their chances for success. To understand how praise can have such negative consequences, you need to understand the work of Carol Dweck. A social psychologist from Stanford University, Dweck has spent most of her research career studying mindsets. She discovered that there are two fundamental mindsets that affect the way you view the world. A fixed mindset is the belief that your qualities, like intelligence and athletic ability, are carved in stone and can’t be changed. You’re either smart, or you’re not. You’re either good at sports, or you belong on the sideline. A growth mindset is the belief that your qualities can be cultivated; you can expand your abilities through effort, good strategies, and guidance from others. The two mindsets affect how people view success and failure. People with a fixed mindset believe that success is due to one’s ability, and failure is due to one’s lack of ability. As a result, people with a fixed mindset are deflated by failure. They shy away from challenges because they don’t want to risk making mistakes and looking bad. People with a growth mindset attribute failure to a lack of effort or skill – things that can be improved through perseverance. When they fail, they don’t view themselves as failures. They believe that mistakes are just problems to be solved. As you might expect, mindset has a profound influence on success in school, work, relationships, and many other areas of life. Praising children’s ability reinforces a fixed mindset. When we praise children’s ability after they experience success (by telling them they’re smart after getting an A on a test, for example), it send the message that success is due to ability. It also send the unintentional message that failure is due to lack of ability. This causes children to fear failure and give up when things get tough. In one classic study, Dweck and her colleague, Claudia Mueller, gave fifth graders a set of moderately difficult questions from an IQ test. All of the children were praised for their performance. Some of them were praised for their intelligence: “Wow…that’s a really good score. You must be smart at this.” Others were praised for their effort: “Wow…that’s a really good score. You must have worked really hard.” As expected, children praised for being smart developed a fixed mindset. When they experienced failure on a second set of very difficult problems, they lost their motivation and did poorly on a third set of easier problems. In contrast, children praised for their effort developed a growth mindset and were persistent in the face of failure. Their motivation and performance didn’t suffer. Failure offers tremendous opportunities for growth. Don’t rob your child of those opportunities. Don’t be afraid of a little constructive criticism. What about the kids who do well without even trying? Don’t praise them. Instead, encourage them to take on more challenging tasks. As the mindset concept gained popularity in parenting and education circles, Dweck noticed that many people have a fundamental misunderstanding of growth mindset. Many people believe that you should praise children’s effort regardless of their performance, but that’s wrong. Praising effort is meaningless when children are not doing well. In the new edition of her book Mindset: The New Psychology of Success, Dweck says that we should praise the learning process that led to the successful outcome, and tie that process to the outcome. Effort is part of the learning process, but it’s not the only part. We should acknowledge children’s strategies, too. Help them understand how their behavior affected the outcome (e.g., “You tried lot of different ways of balancing the bike and, because you keep trying, you finally found the right way!”). When children succeed, praise the strategy. When they fail, help them find another strategy.